A lovely, super quick Italian salad recipe that’s perfect for lunch. 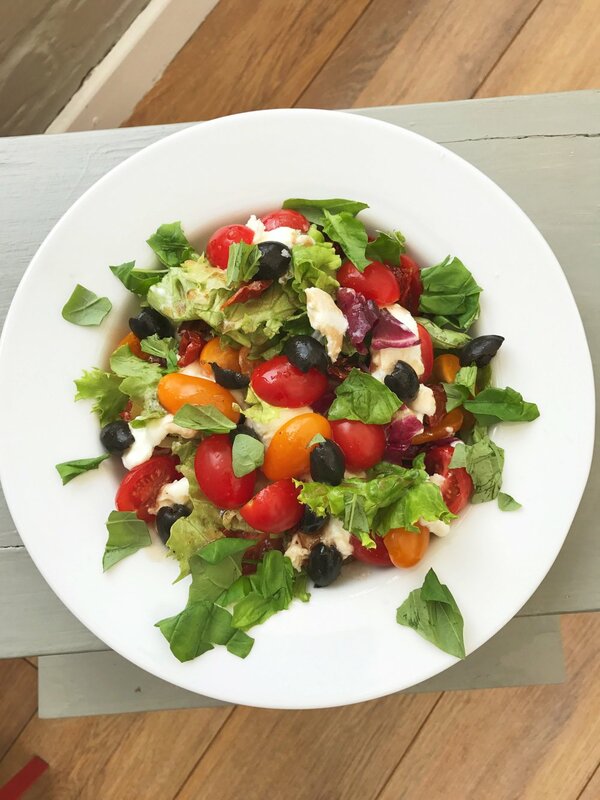 Our rustic Caprese salad throws together buffalo mozzarella, baby plum tomatoes and basil along with torn salad leaves, sun dried tomatoes and black olives for a light but flavoursome salad. Delicious served with a ciabatta roll for an easy lunch. You could throw this in a lunchbox, just pack the dressing separately and drizzle on when you’re ready to eat. A super quick and tasty lunch recipe. Scatter the salad leaves over the plate, top with baby plum tomatoes, torn mozzarella, basil leaves, olives and chopped sun dried tomatoes. Drizzle over the balsamic dressing and eat with ciabatta. spice it up with some little piquante peppers. skip the balsamic dressing and just go with classic sea salt and olive oil. Perfect for lunch with ciabatta roll.